Following the creation of the Department for Business, Energy and Industrial Strategy in July 2016 and firing the starting gun for a string of sector deals, on the 27th November the Government set forth its vision for enhancing UK global competitiveness. The hotly-anticipated White Paper, running to 255 pages underlines the scale and severity of the challenges that have dogged UK productivity and economic performance to date. Since the initial January consultation, there has been some internal re-arranging of priorities with the original ten pillars of Industrial Strategy morphing into “five foundations” and a further four “Grand Challenges” to address. It is reassuring that the oft-relegated domain of ‘place’ has been retained alongside people, ideas, infrastructure and business environment as decisive drivers for economic renewal. Elsewhere, strategic technologies such as electric cars, clean energy and batteries remain front and centre while four sector deals for the life sciences, construction, AI and the automotive sector have now been concluded. The OBR’s downward revision of already lacklustre long-term UK productivity growth over last week’s Budget has renewed the sense of urgency to get industrial strategy right. Acknowledgement that tackling systemic weaknesses and market failures in the skills pipeline, UK digital and physical infrastructure and our ability to commercialise R&D among others will require robust state intervention and fresh funding is to be welcomed. Policy areas however initially earmarked as fertile for review and change such as public procurement or institutions to guide local industrial strategy have been abandoned as stand-alone objectives. The end result is that we are still left searching for answers as to what specific mechanisms and organisations are best placed to help deliver and own this raft of new industrial strategy initiatives. These strategies will co-ordinate between national and local leaders in both the public and private sectors. Places in England with a Mayoral Combined Authority will have a single strategy led by the mayor and supported by Local Enterprise Partnerships. For parts of the country without a mayor, the development of the strategy will be led by the Local Enterprise Partnership. The previous incarnation – Strategic Economic Plans – suffered from being largely similar, with many focussing on the same, broad areas such as Advanced Manufacturing. More intelligent specialisation is needed. To that end LEP governance reforms and more resources are promised as well as changed boundaries – likely to align with Combined Authorities.However, since LEPs depend on local business leadership, it is the weakest regions that may have the weakest leadership at present. Potential economic ‘clusters’ are highlighted with a new competitive £115m Strength in Places Fund, to develop areas of emerging R&D strength – ideally in areas that are struggling currently. Further institutional works is pledged with work “to deepen foundations, identify and remove barriers to growth and strengthen supply chains”. A further question is how Strategies align with the devolved nations. A degree of tax competition may take place if high-level strategy is not agreed between governments – but the forum for this does not exist at present and the England and Welsh strategies appear to have been developed in isolation. In general terms, areas outside South-Central England have a ‘long tail’ of small, unproductive firms. To measure the problem, more micro-level data is now pledged, following the Bean Review of statistics “so people can study and understand our economy”. Prior to the 1980s, civil servants collected detailed regional sector statistics. Today, information is still collected via paper survey. It is to be hoped that the ONS now moves to automated all-firm data collection using HMRC and Local Authority information. 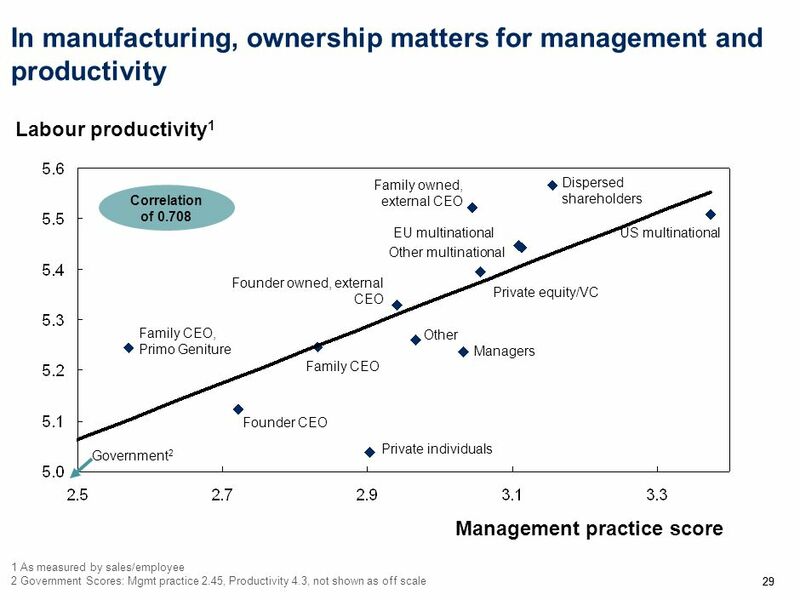 Ownership type is a large determinant in quality of management, with primo geniture managed firms among the worst. To improve unproductive management, a “new Business Basics Programme” will look at disseminating better practices. A commercial investment programme run by the British Business Bank will support developing clusters of business angels outside London. But with many small firms in family management in less productive regions, it is not clear the ‘toolkit’-style approach will reach many firms. A more fruitful approach could be Metro-mayor led local productivity programs that utilise local connections. The Government has long faced criticism for starving the North of transport money while investing in the South. This is an inevitable consequence of traditional value-for-money assessments. On one hand, the new ringfenced Transforming Cities Fund will provide some handouts. Additionally, an attempt to measure the value of investment differently is now proposed in the ‘Rebalancing Toolkit’ for infrastructure. This aims to “take greater account of disparities in productivity and economic opportunity between different places” in measuring the dynamic effects of investment. Up to £1bn will be lent at a discounted rate to English local authorities through the Public Works Loan Board. However, no mention is made of the proposed infrastructure levy on business rates for Metro-mayors, which was in the previous Budget. With clean air still on the agenda, a £220m Clean Air Fund will allow councils to ‘help individuals and businesses adapt’ as measures to improve air quality are implemented. On the positive side, this could mean outright bans or restrictions on pollution sources, with transitional funding for consumers. However, it is disappointing that other infrastructure funds do not mention air quality as a criteria. Investment in wider urban sustainability will improve air quality. The NIC will also look at how future roadbuilding should adapt to supporting self-driving cars. It is vital that this includes implications for the urban environment and road user charging. The mistakes of the 1960s – when cities were redesigned for cars, not people – should not be repeated. Also, the low cost of driverless electric car trips means they will fill up city streets unless some form of charging is inlcuded. The establishment of a Food & Drink Sector Council to work with industry leaders from across the UK food and farming supply chain. A ‘Transforming food production: from farm to fork’ programme to harness UK strengths in advanced sustainable agriculture and channel new investments and enable technology applications across industry. A key challenge for a successful place and sector-based industrial strategy is the attraction and retention of skilled talent. In our assessment of the Government’s industrial strategy priorities, we outlined the need for local and national institutions to address this systemic issue – especially important given the uncertainty surrounding Brexit and its effects on the skilled labour market. Solving this problem requires a multi-faceted approach. The Government has demonstrated that it is committed to STEM subjects – investing £27 million to expand the Teaching for Mastery maths programme and other initiatives, such as £84 million to support the teaching of computing in schools. Combined with the introduction of T levels, first announced in March, this should provide a strong basis for the development of the technical skills needed to make the industrial strategy a reality. Furthermore, the new identification of, and funding for, 12 Opportunity Areas and investment in Teacher Development recognise the need for targeted intervention to improve attainment in underperforming areas and redress the national imbalance in skill levels between London and the South East and the rest of the UK. Despite the upbeat tone of the White Paper– targeted opportunity funding, teaching development, Knowledge Transfer Partnerships – it simply does not go far enough. The Government must think more carefully about how to ensure the labour force is sufficiently tailored and flexible for the high-growth areas identified by the Industrial Strategy. The review of technical qualifications and roll-out of the new T levels must be accompanied by a realistic pathway to higher-level qualifications and skill specialisation if students are to benefit from the opportunities created by innovation, in sectors such as nuclear, construction and digital. Without this, investment in apprenticeships and job creation is reduced to a box-ticking exercise that lacks real strategic impact or sustainability. The Creative Industries currently comprise 5% of the UK economy – a figure that only looks set to grow, given the resistance of jobs in the sector to automation and the success of the emergent digital, creative and broadcast cluster in many parts of the country. The Government has clearly shown commitment to expanding upon its success (and the £87bn GVA it creates) with its soon to be agreed sector deal, increased investment into VR and AR via the Industrial Strategy Challenge Fund and its support of eight research partnerships in the sector. This policy of ‘Key Creative Clusters’ is important and timely. However, the Government must ensure that investment is not too thinly dispersed. The creative industries comprise nine sub-sectors and are part of a wider creative economy, all of which have their own specialisms and supply-chain needs. The new national Creative Industries Policy and Evidence Centre will thus play a key role in ensuring that investment and institutions are located in places where competitive advantages can be achieved through smart specialisation. Not all places can be world leading across all sub-sectors of the creative industry. This approach will enable the UK to take advantage of the agglomeration effects of co-location, such as in MediaCity UK in Salford, where the BBC in particular has acted as an anchor institution around which a thriving community of digital, media and broadcast creatives has developed. This is the vision that we would like to see across the country – allowing for specific areas to specialise in their own sub-sectors such as as ceramics, broadcasting, cultural tourism or game development (via initiatives such as the UK Games Fund), so that they can reap the maximum benefits of cooperation and co-location possible.